Being a quality driven organization, we are offering our clients a wide assortment superior quality Surface Protection Film which is available in various types, in order to provide different adhesion for different surfaces. Further, it provides low adhesion, for acrylic and PC sheet, polished stainless steel, Aluminum, brass plate, and other smooth surface. 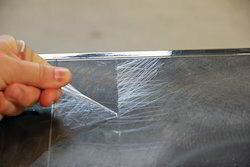 We have specially formulated Non residue Protection Film also known as Non Transfer Protection Film. It is a specially crafted Protection Film which provides temporary protection to sensitive and low energy surfaces. The adhesive strength and thickness of the film can be tailor made as per the specifications of the product and the level of protection required. Non residue protection film is ideal for protection of sensitive or easily scratchable surfaces during their transport, installation or storage. This product is trade marked under the brand name BC Fix Non Transfer Protection Film. BC FIX is a Self-adhesive Floor Protection film that is specially made for protection of various kinds of floorings. It's low-tack adhesive clings to smooth surfaces without shifting and can simply be peeled away after use without leaving any sticky residue. 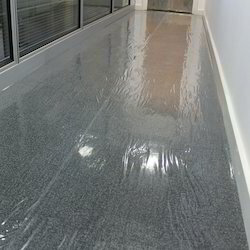 BC FIX Floor Protection Film is specially formulated with 75/125/200 micron films for protection of all kinds of floors during construction, plastering, painting, remodeling, renovations and repairs. Provides protection for hard surfaces. Resistant to tearing and scuffing. Roll it on and it stays where you want it. Easily removable after the job is completed. This Self-adhesive floor protection film will withstand the construction activities and foot traffic in normal circumstances. Eliminating the slippage, leakage and lack of visibility hazards associated with dust. BC FIX Floor Protection Film gives protection from spillages, scratches, dirt and debris during building, renovation and decoration projects of Houses, offices, malls, shops, multiplexes, factories etc. The film can be vacuumed, swept or mopped to keep the work area clean. Make sure the surface to be protected has been cleaned and is dry. 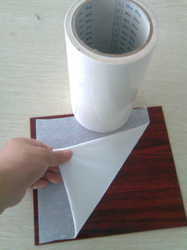 Open the packing and put the adhesive side of the roll on the surface to be protected and roll out, while Simply pressing the film to the surface by hand. *The brand name is trade marked by Brite Coatings Pvt. Ltd.
We manufacture Furniture Protection Film that is used to protect furniture from scratches, nicks, abrasions and dust. During activities such as transportation, remodeling/refurbishing etc. Our Furniture Protection film protects your finished surfaces to maintain maximum value. Our products are popularly known under thr brand name BC Fix Furniture Protection Film. Protection film can be easily applied offering durable protection.It can be easily removed without leaving any residue on the substrate that it is applied on to protect. 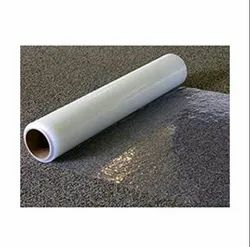 We manufacture Carpet protection film which is made using PE film. It is used to protect Carpets from dust while transportation and to protect the carpet during remodeling and refurbishing activities. Our Carpet protection film provides maximum protection to your carpets from dust and spillage. This product is known under the name of BC Fix Carpet Protection Film. Carpet protection film can be easily applied offering durable protection and it can be easily removed without leaving any residue or damaging the carpet. This product is manufactured in an ISO 9001:2008 QMS Certified Plant. We Brite Coatings Pvt. Ltd. are one of the sole manufacturers of Low Tac protection film which is used to protect the top side of a mobile phone screen guard before their application. This product finds a wide range of application for protection of sensitive or thin surfaces during transport, packaging and installation. This is mainly due to its non transferability effectiveness and range or transparent or opaque varieties. 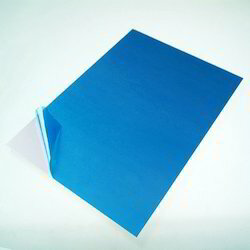 Looking for Surface Protection Film ?